It is possible to make your travel dreams a reality, even on a tight budget! 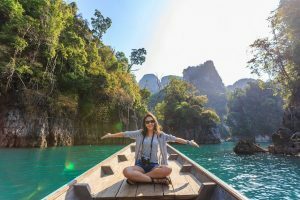 People who travel frequently have it figured out that you don’t have to be very lucky, independently wealthy or jobless to be able to travel to your heart’s content. Yes, it is important to understand that there are no free rides when it comes to traveling. Tourism doesn’t have to be outrageously expensive, it can be done on a budget. In fact, you can even save money when traveling. Of course, for that to happen, travelers have to prioritize their expenses and make sacrifices in many areas during their adventures. But they come out all the better for it. Remember, it’s about living a modest life, as free of gadgets and tech as possible, wearing your old clothes, and eating in as often as possible. Here are some money saving tips to help you travel like a pro. It is extremely important to choose your travel destination wisely. It is a good idea to select one that is available and accessible off-season. This way you will find it relatively empty and peaceful, as most people won’t be heading to that place. It’s cliché, we know. But at the same time it is the easiest way to save money while traveling. We aren’t asking you to pick a location with bad weather. There are plenty of places in the world that are great even in off season. Take for example, Darjeeling India. The tourist season officially starts in October, and if you get there a month early in September, you will find it to be relatively peaceful and a lot cheaper. The tourist spots aren’t crowded yet and you can have a great time enjoying the natural beauty that place has to offer. Again, there is absolutely no need to compromise on your safety and comfort during your travels. All we are saying is that you should research the options available before heading to your destination. For example, there are cheap airline flights that will get you there on time, as long as you can live through sitting with a cramped leg space, or no inflight meals. Similarly, you can forego deluxe AC buses for the coach, so what if it will take you an extra hour to get to your destination? You have saved quite a lot of money in the meanwhile. Eating out can add up to be a huge expenditure when you’re on vacation. As mentioned earlier, try to avoid global fast food chains when traveling. Eat local cuisine as much as possible. Ask locals for advice on what to eat and where. It’s a good idea to book an accommodation with its own kitchen area. It might sound ridiculous to cook while on vacation, but just hear us out. Room service is very expensive, and you can probably feed yourself for an entire day for the price of a cup of coffee in the hotel. Eat in for breakfast and lunch, and have a grand dinner if you must. A microwave and fridge will make your holidays so much better, because then you have reheat leftovers and save food from the last night as well. If you are living in a homestay or hostel, please make sure that you clean up before moving out. The same principle of ‘comfort foremost’ applies here as well. Now think about it for a minute, you won’t be spending a lot of time in the hotel room. In all honesty, you just need a place to stash your stuff, wash and sleep. So why spend all that extra cash on a room with a view, when you can go down and be at the ‘view’? Try Airbnb, Wudstay and HeyBnB for more affordable homestay opportunities, or find a hostel in your destination. Yes, big departmental stores are certainly attractive. But try not to buy anything there. Instead, find out where the locals shop and go there instead. Do what locals do, and get a real feel for the place and save some money in the course of your travels. Walk, cycle, shop and eat like the locals. This will help you explore the destination and you will get to discover more as a traveler as well. Farmer’s markets sell affordably priced produce and food, especially towards the end of the day. When you buy locally, you will get a taste for the real taste of the local cuisine. Head on over back to your accommodation and cook it up! We hope these tips help you save money as you have your adventures. Happy travelling. James Crook is a passionate technology and lifestyle blogger. He loves to get engaged with the readers who are seeking for home, lifestyle, and tech-related information on the internet. Currently associated with NYC moving company All Around Moving which specializes in arranging and assembling services of professional and skilled local movers locally in New York City as well as areas in New Jersey, Connecticut and the Miami Dale area in South Florida for their blog operations. Follow @jamescrook911 for more updates.